To allow ample time for all patients and scheduled surgical procedures, Companion Animal Hospital operates primarily by appointment. Our Veterinarians and staff make a sincere effort to see each client on time. However, emergency cases do arise, and when they do, they receive top priority. This may cause occasional appointment delays. Your understanding is greatly appreciated. Please remember that all appointments are scheduled on Eastern Standard Time. For your convenience, we offer 'drop-off' appointments by appointment only. This allows you to schedule your pet at a convenient time and leave him/her with us for a couple of hours. Drop-off appointments are scheduled in the morning so our veterinarians can thoroughly examine your pet. Once the doctor is done, our veterinary staff will call you to review the diagnosis and to give you discharge instructions. For the safety of all animals and our staff we require all vaccinations be up to date. Before entering our reception area, all pets must be properly restrained. For your protection, and that of others, all dogs must be on a leash and properly controlled while in the waiting area or exam rooms. All cats must be presented in an appropriate cat carrier or on a leash. Although we make every effort to make our patients feel comfortable, there are time where pets can be uneasy about new people, new surroundings, and other pets.This is the most important reason why we ask our clients to restrain their pets. We appreciate your cooperation. For your convenience, we accept Visa, MasterCard, Discover, cash and personal checks. 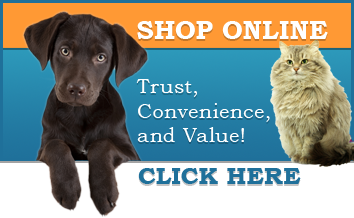 CareCredit is a revolving line of credit, specifically for the healthcare needs of your pet. No interest and extended payment plan options are available. One of our customer service specialists will be glad to go over this program with you and help you with the instant credit application.